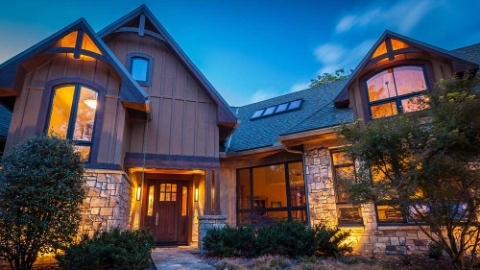 4 Forty Four has been building custom mountain homes in Western North Carolina for over a decade. Owner Kevin Troyer’s father was a block mason, and Kevin began working summer construction when he was twelve. It was always his desire to have a business that built custom homes. When he and his wife Lillie moved to Western North Carolina, they realized that it was the kind of place to put down roots. Since then, the company has enjoyed dramatic growth and acquired a diverse portfolio of NC custom homes. We are happy to work anywhere within the communities of Western North Carolina. If you are looking for a lot to build your dream home, we have strong working relationships with many developers in our community. Mountain homes are very diverse. We’ve yet to see one that uses only one architectural theme or style. Our clients often come to us with pictures and ideas that show details they like and are drawn to. Nothing gives us more joy than discovering your dream and giving you the words to describe it. We help you take these ideas and put them together in a way that is practical, fiscally responsible, and fits together flawlessly. At 4 Forty Four, we embrace the creative process and enjoy traveling the path from conceptual ideas to a practically defined and finished home. Our goal is to help you live in your dream. There’s a lot that goes into building and remodeling a home. We want to make sure that we effectively communicate with our clients and with each professional involved in your project. During each project, we keep our clients updated via e-mails and phone calls. We have a detailed invoicing process with weekly budget reports, photos and a cloud based scheduling platform to keep our clients current and informed. 4 Forty Four has many clients that are willing to give references. However, the privacy of our clients is very important to us. Once we’ve gotten to know a little bit more about you and your level of interest in 4 Forty Four, we would be happy to give you a number of references. We have found that the most efficient way to build or remodel a home is to plan ahead as much as possible. We buy local materials whenever it makes sense. We are responsible with your time and ours. Efficiency and cost effectiveness are some of our core values. If you are interested in getting a quote for your project, contact 4 Forty Four.